Athens is an immensely successful (population just over 100,000) university town in the hills of northeastern Georgia. The University of Georgia has helped to create an unusually liberal community with a thriving artistic, literary, musical, and intellectual scene. A number of musical groups such as REM and the B-52’s have gone on to international fame from here. 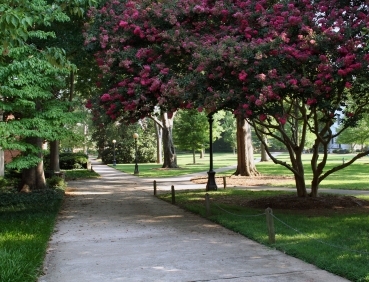 The University of Georgia with its 26,000 students has a large and beneficial impact on the city. The downtown, centered on College Avenue, is one of the most interesting and vital centers in the nation. It offers many interesting restaurants, nightclubs, music stores, sidewalk cafes, bars, bookstores, and shops. Athens is located in Athens-Clarke County. There are many different neighborhoods to consider, such as west of Pulaski Street, where there are a number of historic homes. Five Points is another neighborhood near the downtown and the university. Five Points is mostly single family homes with nearby shopping and galleries. Fourteen of Athens’ neighborhoods are listed on the National Register of Historic Places. There are some golf communities in or near Athens (see link at right). According to Zillow.com, the median home value was $177,000 in early 2019, and calls it as a "Very Hot" market at this time. Active adults who have moved to Athens report that it is not without its problems. They report there is no supermarket close to downtown. Public transportation is not all that it could be. And it can be hard to find an affordable apartment. Athens is located in the hills of northeastern Georgia, 71 miles from Atlanta. View Google Map for Athens GA. The average July high temp. is 90, the avg. Jan. high is 53, and the average Jan. low is 33. March is the wettest month with 5". There are many festivals, such as the AthFest - Music and Art Festival, Stitching Stars Storytelling Festival, and the Athens Music Hall of Fame. The University of Georgia’s Performing Arts Center offers many cultural resources. Many nightclubs in downtown Athens, such as the 40 Watt Club and the Georgia Theatre. The downtown Classic Center is a multi-purpose facility containing a performing arts center and convention space. Additional cultural enrichment and lectures are available at the Georgia Museum of Art and its new Lamar Dood School of Art. There is an Osher Lifelong Learning Institute. Athens has a high crime rate. Athens Airport offers commuter flights to Charlotte, NC; Athens Transit System offers local mass transit; Athens is above average in walkability when compared to other communities.